2. This tour is suitable for your arrival at Beijing airport at Beijing time before 7AM and departs at 7PM Beijing time or later. Hi, this tour is available on 5th april 2019? Yes, this tour is available for Apr. 5, 2019. We just sent you an email about the tour details, please check. Thank you! I arrive at 5.10am, so I suppose I can’t make it to the 7am tour? Yes, we do not think you can meet our guide at 7am. Especially more people wait in line to apply the visa free in the morning of weekend. Sorry about that! We will keep you posted. is there the option to join in on April 7th on a budget-join-in group tour from 9am to the Great Wall and Forbidden City? 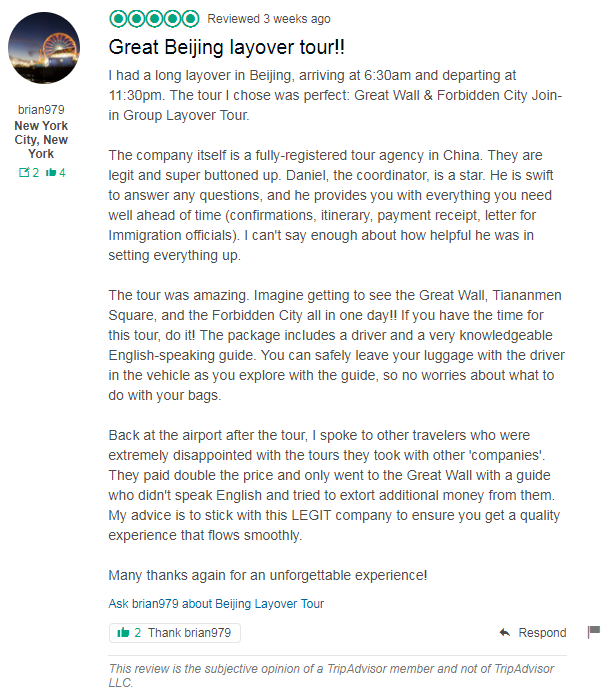 We only have Mutianyu Great Wall Join-In Group Layover Tour Itinerary A (7AM-11AM) and Great Wall & Forbidden City Join-In Group Layover Tour A (7AM-3PM) available for Apr. 7, 2019 so far. We will email you once 9am tour is available. Thank you!